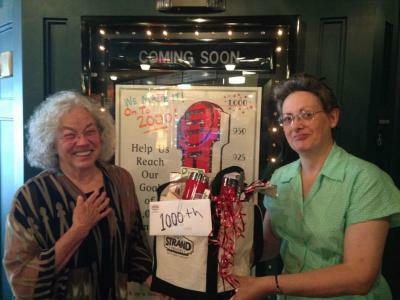 The Strand reached its Summer Membership Drive goal of reaching the level of 1,000 Members by August 31. Anna Jennings of Rockland was recognized as the 1,000th person to join the Strand’s Membership program. Anna was presented with a gift bag and warm thanks from Membership Coordinator Jessica Ripley and Theater Manager Liz McLeod. Anna shared a few stories about her first visits to the Strand in 2007, including one about a several-hour wait in the rain with two friends to be one of the first in line to buy season tickets for the Strand’s first-ever Metropolitan Opera Live-In-HD season. The theater, which has been designated a National Historic Landmark by the National Trust for Historic Preservation, became a nonprofit in January 2014 and is now operated by Friends of the Strand Theatre. The Strand’s Membership program was launched in April 2014. Memberships, as well as grants, sponsorships and fundraising efforts, help pay the operating expenses for the wide range of cultural and educational programming the theater presents.